The big landlords of eastern Germany have loomed large in Germany's history, but the absence of official statistics on land ownership has left their position and identity confined mostly to folklore, without satisfactory quantification. 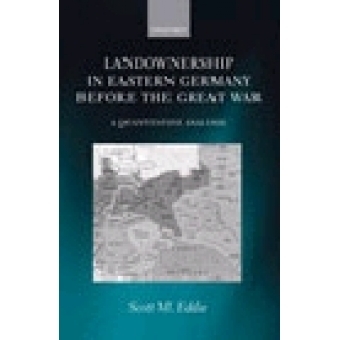 This book, making extensive use of primary sources from the seven 'core provinces' of eastern Germany (East Elbia), establishes answers to questions pivotal to our understanding of pre-war Germany: who were the biggest land owners, both by area and by the value of their land? Which social groups held land, how much, and where? How did this change, especially during the last decades before 1914? The bourgeoisie had made substantial inroads into land ownership by the mid-1850s, in at least some areas even before the mid-1830s. Despite rapid industrialization after 1880, the process was reversed, so there was a net exodus of bourgeois owners from the ranks of large land owners, just as there was of lesser nobility (barons and untitled nobles). On the eve of war, ownership of large estates was even more concentrated in the hands of the Prussian state, the Prussian royal family, and the higher nobility than it had been in the early 1880s. Among the other contributions of this book are analysis of the extent of rural industry in East Elbia, evaluation of the land endowment of the seven provinces, description of the ownership of knight's estates, and investigation of possible favouritism in the land tax assessment system.